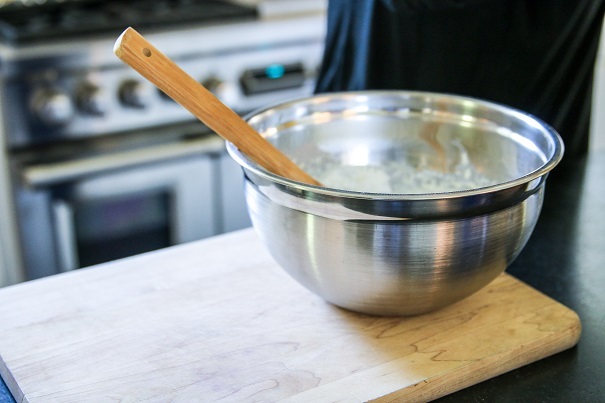 Combine flour and sugar in a mixing bowl and stir in cream to make a wet dough. 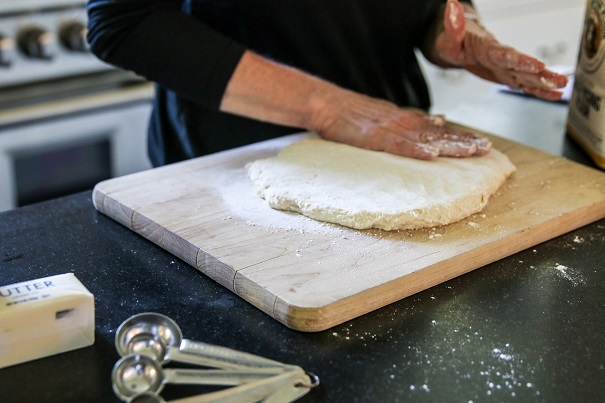 Turn the dough out onto a well-floured work surface and press the dough out until it’s about ½ inch thick. You will need to add flour to your fingers to keep them from sticking to the dough. Cut rounds of dough with a biscuit cutter (I used three sizes: 2 inch, 3 inch and 4 inch, so guests could choose among several different sies.) and place on a Silpat-covered baking sheet. 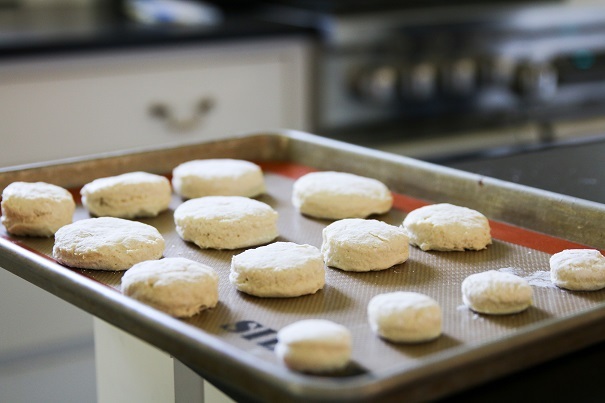 Press dough scraps back together to cut more biscuits, but try not to overwork the dough, and try not to twist the cutter when pressing down on the dough – both things will make the dough tough. Brush tops of biscuits with melted butter. Bake for 10 minutes until golden brown. Brush tops of biscuits again with melted butter after taking them out of the oven, and allow to cool. In a baking dish, place ham cut in half and face down and pour sherry over ham, if you are using sherry. Sprinkle brown sugar over ham and cover with aluminum foil or pot lid. I prefer a sugar-cured ham, rather than a salty one, but that is a matter of personal preference. Bake the ham for one hour at 325 degrees. Allow ham to cool and slice into small pieces, trimming off any fat or gristle. 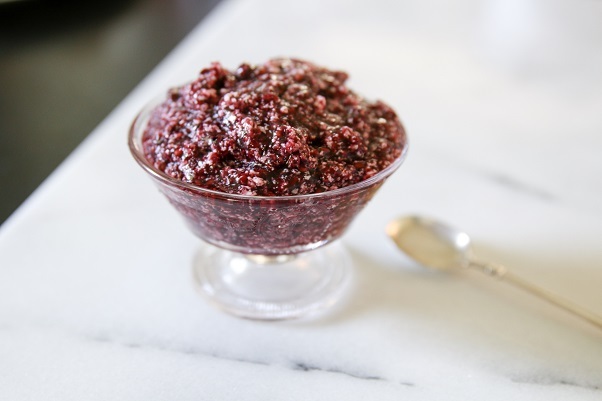 Mix butter, honey and blackberries in a food processor or blender until well-combined. Split biscuits and pile ham onto lower half of biscuit. 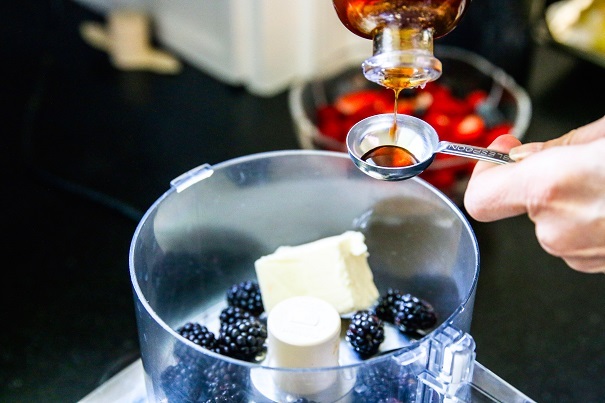 Slather top of ham with blackberry honey butter, replace top of biscuit and serve. 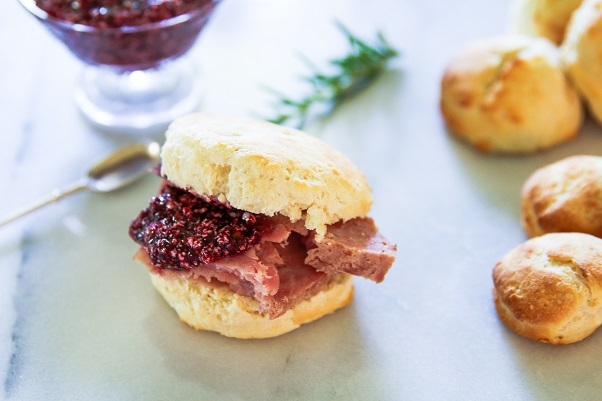 Loved your biscuit with ham and BlackBerry Honey Butter! Thank you very much! Keep reading, lots of yummy recipes coming your way! Sounds great. I have never cooked biscuits at such a high heat before, usually around 420*. Since these are cooked so fast at such a high heat, will the center of the biscuit be gummy or fluffy? The insides will be crumbly, but not gummy or fluffy. This biscuit has no baking powder – on purpose – because we didn’t want to make the biscuit so high people couldn’t get it in their mouths. I hope you give it a try!